This is a really great, vintage, Piggy Bank made by Shawnee Pottery. This Piggy Bank is a cream color with pink and blue accents. It measures 6 inches high and is in really good condition with no chips, cracks or scratches. Be sure to search our other Shawnee available. We guarantee items to be as described. THANK YOU. 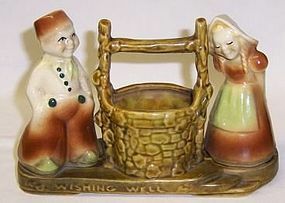 This is a really nice Wishing Well Planter with Dutch Boy and Girl made by Shawnee. It is signed on the front WISHING WELL and on the bottom SHAWNEE USA. This Planter measures 8 1/4 inches long X 5 1/4 inches high. It is in very good condition with no chips or cracks. Be sure to see our other pottery available. We guarantee all items to be as described. Feel free to email with any questions. THANK YOU.